Effects of Hydrogen Peroxide on Modulation of Copper-Dependent Redox Cycling by Metallothionein"
Abbreviations: PnA = parinaric acid; DMPO = 5,5-dimethyl-l-pyrroline-N-oxide.
" From J. P. Fabisiak, V. A. Tyurin, Y. Y. Tyurina, G. G. Borisenko, A. Korotaeva, B. R. Pitt, J. S. Lazo, and V. E. Kagan./lrdi. Biochem. Biophys. 363,171 (1999); and J. P. Fabisiak, L. L. Pearce, G. G. Borisenko, Y. Y. Tyurina, V. A. Tyurin, J. Razzack, J. S. Lazo, B. R. Pitt, and V. E. Kagan, Antioxidants Redox Signal. 1, 349 (1999). absorbance at 343 nm is read with a SpectroMate UV-visible (UV-Vis) fiberoptic microspectrophotometer (World Precision Instruments, Sarasota, FL) equipped with a 2-pi micropipetter cuvette. The number of reduced SH groups per molecule of MT can be calculated on the basis of the extinction coefficient of £343 = 7600 M_1 cm-1 and the actual protein content determined as described in step 4. Aliquots of freshly reduced MT can be stored frozen at —80° for several weeks without appreciable loss of DTDP reactivity. The effects of prolonged storage or varying conditions on MT protein content and SH integrity should be assessed. 18 P. Chen, P. Onana, C. F. Shaw III, and D. H. Petering, Biochem. J. 317, 389 (1996). decrement in the molar ratio of copper : MT at which copper-dependent redox cycling can first be observed. This implies an inverse correlation between the degree of MT SH modification and the ability of MT to bind copper in a redox-inert manner. SH groups are also physiologically important sites for modification by NO; however, the potential of MT to regenerate reduced SH groups after nitrosative modification has received little attention. We, therefore, investigated the ability of the endogenous reductant dihydrolipoic acid (DHLA) to regenerate MT thiols after exposure to NO. Freshly reduced native MT (0.03 mM) is exposed to the NO donor, 8 mMNOC-15 (Alexis, San Diego, CA), in 10 mMTris, pH 7.4, for 15 min at 37°. NOC-15 is removed and MT is recovered in the retentate after centrifugation four times through Microcon YM-3 filters. To test the effect of DHLA, NO-exposed MT is then incubated with 0.6 mM DHLA (Sigma) in buffer containing 100 mM desferoxamine and 100 m M diethylenetriaminepentaacetic acid to chelate any adventitious iron or copper, respectively, for 30 min at 37°. DHLA-regenerated MT is recovered by filter ultracentrifugation as described above. 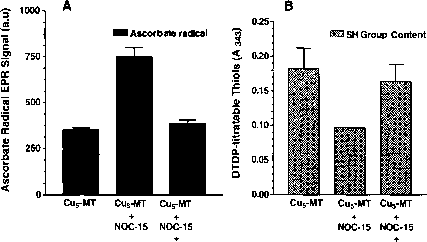 Exposure of purified MT containing copper (5 mol of Cu : 1 mol of MT) to the NO donor, NOC-15, enhances redox-cycling activity of copper as shown by increases in its ability to catalyze the one-electron oxidation of ascorbate to form ascorbate radical, which is detectable by EPR spectroscopy (Fig. 1A). This effect can be reversed by the physiologically relevant reductant, DHLA. Figure 1A further shows that changes in copper-dependent redox cycling are paralleled by concomitant reductions and restoration of MT SH group content (Fig. 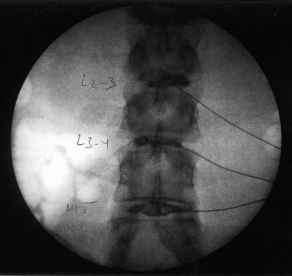 IB) after NO exposure and DHLA treatment, respectively. Essentially identical results are obtained if DHLA itself is replaced with an enzymatic recycling system consisting of lipoamide dehydrogenase (0.1 U/ml), lipoic acid (1.2 mM), and NADH (4 mM) (data not shown). Because the nitrosation and regeneration steps are carried out separately these effects represent a direct effect of DHLA on the modified protein and not the ability to quench RNS/ROS. Thus, DHLA could serve to couple MT to an efficient protein repair system in vivo, and because lipoic acid can readily be taken up by cells it is feasible to use it as a pharmacologic agent to augment protein repair, as it would be converted to bioactive DHLA by intracellular metabolism. Fig. 1. DHLA regeneration of reduced sulfhydryls in MT exposed to NO and restoration of copper-binding capacity. Native, NO-exposed, and DHLA-regenerated MT were exposed to CUSO4 (5 :1 molar ratio of copper : MT) and sodium ascorbate (500 fiM). EPR spectra for ascorbate radical were obtained by repeated scanning, using 335.4 mT, center field; 0.3 mT, sweep width; 0.05 mT, field modulation; 10 mW, microwave power; 0.3 sec, time constant; 20 sec, time scan. (A) Amplitude of the ascorbate radical signal obtained 8 min after incubation of the various Cu-MTs plus ascorbate. (B) MT thiol content in the retentate measured by optical absorbance at 343 nm after reaction with DTDR Data in both (A) and (B) represent means ± SD obtained from at least three observations. are performed in the presence of ascorbate, whose one-electron oxidation by copper can be monitored quantitatively by EPR measurement of ascorbate radical. Importantly, negligible redox-cycling activity of copper is observed during copper transfer to the apoenzyme (Fig. 2B). A detailed protocol describing the in vitro assessment of intramolecular transfer of copper from MT to apo/ZnSOD is provided below. 1. Apo/ZnSOD is prepared by dissolving Cu,ZnSOD prepared from bovine erythrocytes (Sigma) to a final concentration of 0.1 mM in 0.1 M potassium phosphate buffer (pH 7.4).19 The copper chelator diethyl dithiocarbamate is added to achieve a chelator : protein ratio of 10:1 and incubated for 3 hr at 37°. The yellow insoluble diethyl dithiocarbamate-copper complex is removed by centrifugation at 39,000g for 30 min at 4°. The resultant supernatant is then exhaustively dialyzed against phosphate buffer and stored at 4°. 19 D. Cocco, L. Calabrese, A. Rigo, F. Marmocchi, and G. Rotilio, Biochem. J. 199, 675 (1981).